Aiá'merán (589 b.S.-209 b.S.) was Ránn of the ill fated Aellenrhim, and later Avá'ránn of the elven people. She united the elven tribes more than any leader before her, but after years of trying to halt the advance of Coór'Mélor, also called the Serpent, she was raped by the Coór'Melór himself and later gave birth to twins boys, who would grow up to be Eyrin Fontramonn and Saban Blackcloak. She herself died in childbirth. 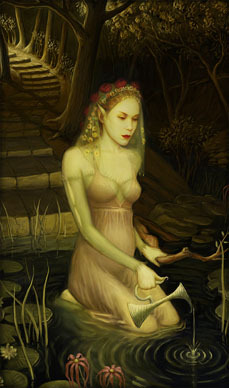 Picture description: The pregnant elf Aiá'merán performing the Aellenrhim cleansing ritual. Image drawn by Eratinalinfalah. Biography. Aiá'merán was born to the Ránn of the Aellenrhim, in the period between SW I and SW II, which for the elves at least was a period of blissful peace. At the age of 100 she became the Ránn of the Aellenrhim tribe, and remained their chosen leader until her death. In her long life she became perhaps the wisest of wood elves. As such it was no suprise that she was chosen to lead the High Elven Circle and became the Avá'ránn. The rest of her life was a dedicated struggle to prevent the Coming of the Shadow as was prophesied by the Oracle of Cartoral, but in the course of her life's work she became prisoner of the Serpent. She was raped and the two children she bore were to bring the prophecy to fulfilment. Aiá'merán was born the child of Daltelár, Lady of the Bolder forest. Daltelár is said to have been the eldest of living elves of his time and also to spent much time with the High Avá'ránn in the beginning of the Dream. Daltelár had led the elves since the awareness of the tribe was shaped and was loved as she loved them. The time came when the great Lady Daltelár decided that for shores unknown to the wood elves she must travel. Aiá'merán was raised by her mother for that day when she was to succeed her. She had inherited the grace of her mother, and in her eyes were the secrets of the dawn of existence that her mother had shared with her. While deeply saddened by the departure of their Lady, Aiá'merán soon became a respected Avá'ránn. And as time went on and her own life continued her experience of the Dream grew. The Dreamer had also granted her a wisdom and beauty that many have said to be unsurpassed on Caelereth since her death. Under her guardianship the tribe flourished, with beautiiful towns built among the trees, and their proudest achievement was a huge library in the very centre of the Bolder forest. Aiá'merán sent Aellenrhim bards and adventurers to the furthest reaches of the land to collect the elven myths, histories and prophecies of each elven tribe, and were committed to paper for the first time in a huge Compendium, the Ó'dosía ("Everlasting books"). When the task had been completed, the Aellenrhim began to catalogue the details of other races. The result was a survey of the world that had been unsurpassed until the publishing of the Mène'téka. Then news came from the Calmarios forest that orcs, dark elves and barbarians (the Shadowtroops) had launched an offensive, but were easily defeated. The Aellenrhim all knew what it signalled, and so did Aiá'merán. She traveled to the High Elven Circle that year, determined the world would not be unwarned. The Circle listened to Aiá'merán, but felt that the Shadowtroops posed little risk. Aiá'merán was incensed and started gathering as much information as she could on what was to come. She shared this with the Circle at the next meeting in 240 b.S., and won some support from the more northern tribes. With the coming Mélor'Terquán ("The Night of the Turning Shadow"), the High Elven Circle was convinced, but too late. Later that year, the Coór incarnate, Coór'Mélor the Serpent, descended upon the lands of Caelereth. Aiá'merán with the consent of the Circle made preparations for the invasion of Shadowtroops that must surely come with Coór'Mélor. It became her only occupation. She was determined that she should cheat fate, and that the prophecy of the Oracle of Cartoral should not come to pass. Day to day running of the tribe was delegated to the elders of the Aellenrhim tribe. The invasion came in 215 b.S. Elven, human and dwarven tribes alike rode out to meet the dark forces. Despite Aiá'merán's best efforts, the initial battles ended in stalemate, with the southern forces making decisive defeats against the Shadowtroops, while the northern tribes lost ground to Coór'Mélor due to sheer weight of enemy troops. Aiá'merán spent the next fifteen years trying to rid Sarvonia of Coór'Mélor, unsuccessfully. Meanwhile, Coór'Mélor plotted to corrupt the elven race. He bided his time. Then, in 210 b.S., the time finally came. Aiá'merán sent most of her troops to assist in defending the important human city of Voldar, the capital of the Tharanian kingdom, to prevent its fall to the enemy. Nights after the armies departure, Coór'Mélor stole into the chamber of the unprotected Aiá'merán and raped her. He then departed south, but never wandered to far from his victim's realm, knowing that Aiá'merán bore his heir in her womb. Aiá'merán was distraught. She could not bear to take the life of her unborn child, nor bring herself to end on her own, so unnatural was the act. Yet she knew by her very survival she had failed to cheat fate in the way she had worked so hard to. Aiá'merán gave up leadership of the High Elven Circle, but she remained the Aellenrhim's chosen leader until her death. Ten months later Aiá'merán gave birth to twin boys. The labour was long and complications during the birth of the second child, who would grow up to be Eyrin Fontramonn, exhausted the Avá'ránn so much that she died before the second child was fully born, and it had to be pulled from her womb. The children were kept by the tribe as a mark of respect to their beloved Avá'ránn. But not for long. A ravaging orcish army rode through the forest, taking all the tribe's children and killing and slaughetering all elves in their way as they searched for the heir of Coór'Mélor. No new Avá'ránn was chosen after her death. The Aellenrhim tribe, though nearly extinct, was ruled by the elders as before. Aiá'merán was the most beloved treasure of the Aellenrhim, alas she was also their downfall. Though her people insist that so beautiful a spirit will only be kept from Caelereth for a while, and they expected her to return one day.